News One is reporting that organizers have set a new date in October for the dedication of the Martin Luther King, Jr. National Memorial in Washington. Executive Architect Ed Jackson Jr. told the Associated Press on Sunday that the memorial will now be dedicated Oct. 16. A formal announcement is expected soon. 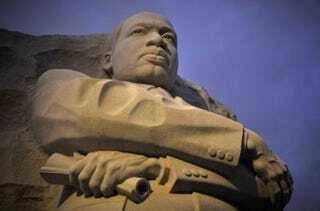 The dedication had been planned for Aug. 28, the 48th anniversary of King's "I Have a Dream" speech. But it was delayed by Hurricane Irene, which swept through Washington with high winds and rain. The dedication will now take place on the 16th anniversary of the Million Man March. We'll be there with bells on. Will you? Read more at News One. In other news: VIDEO: Serena Williams 'Upset' at U.S. Open.